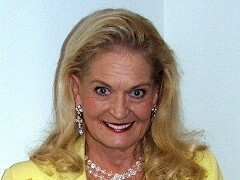 Lynn Anderson is best known for her crossover megahit "Rose Garden" but her career counts way more great achievement. 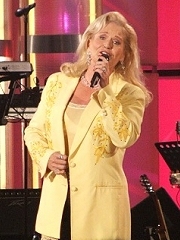 A former rival of Dolly Parton, Tammy Wynette and Loretta Lynn got a Grammy award in 1971 and that same year was named the CMA Female Vocalist of the Year. Her album "Rose Garden" was the best selling country album by a female artist from 1971 to 1997, when Shania Twain broke the record with her eponymous "Come On Over". 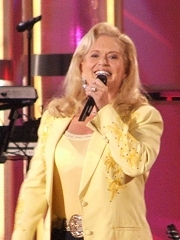 Lynn Anderson was also the first female country artist to sell out the Madison Square Garden . 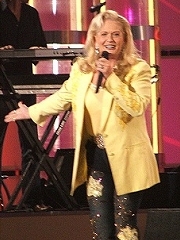 Apart from her music career, Lynn is also a successful rodeo rider and a 7-time world champion. 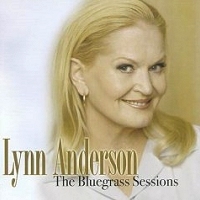 In 2004 she recorded a collection of her biggest hits in a bluegrass style, which earned her a Grammy nomination for the best bluegrass album. 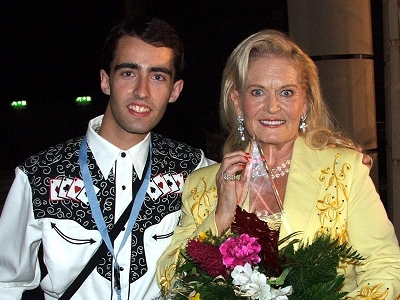 I was honored to interview her when she was inducted to the German Hal of Fame on September 30, 2006. You started out when you were very young. How did you take that big success as a teenager? "It was wonderful! I began singing because my mother, Liz Anderson, was signed to RCA by Chet Atkins. Her producer was the same producer from Elvis Presley. I went to Nashville to sing harmony with my mother. I was a teenager from California and everybody thought that was wild so they ga ve me a record contract." What career did you start first? Singing or riding horses? "Both. From when I was very small, my mother said I'd sing before I could talk. Like in my crib: lalalalala... And always from when I could walk I always with the horses. I was never afraid. My grand parents had horses. I would walk up and put my arms around their legs until somebody put me up on top. So always singing, always horses." What is your biggest success in riding? "In horseback? Last week I won the cutting horse in Roundup, Texas for autism, for autistic children. And probably the World Championship. I have seven times the Champion of the World. In cutting and reining, lots of events. I love to ride." "Yeah, last week! I got a new beltbuckle and a trophy last week!" I heard that you even do auto-racing. "Yeah, years ago. I won a couple of auto-races, too. I drove in Indianapolis, I drove Indy 500. Crazy, hah?" "No, it wasn't Marty Robbins. I beat Marty Robbins' son, Ronny. Marty was pro, Marty Robbins was great. But when they had the Celebrity Race in Nashville, most of us had regular cars, but Ronny Robbins came in with Marty's car. It was called Devil Woman. Very fast! We started our engines and they go vrum, vrum, vrum, vrum... Ronny Robbins started his car and it goes VRUM, VRUM, VRUM, VRUM... Huge motor! So everybody else went to mechanics and started putting special things in the cars. Yeah, I beat him!" I think I saw the car in the Grand Ole Opry Museum in Nashville. "Yeah, that's it . Devil Woman." I heard you also compete with Brooks & Dunn in auto-racing. "Yes. Kix Brooks is very good with horses and he wanted me to get him started with the cutting horses. Yeah, I ride against him sometimes." In terms of singing, what is the hardest part of staying in the business? "The hardest part, of course, is that there are always new people coming. For the most part in America if you're past 30 then they say you're too old. So I'm very lucky I've been singing for a long time. I started when I was very young but I still love to do it and thank God, they still let me do it. I don't tour a lot but enough to be happy because music makes me happy. My music and my horses make me happy." "No, it's OK. I don't mind. I think it's a compliment. It's very nice and I'm blessed. If nobody knew me I'd probably be upset then. So it's OK."
What is the hardest part of balancing a music career and a family? The hardest part is traveling. To get to Germany, for example. My daughter is traveling with me now. She has grown up in the music business and she has a corporation now so she makes recordings, she makes the manufacture, the business part. My children know the music, they know the bad part and they know the good part. So they understand." Who came out with the idea for the Bluegrass Sessions? "Bil VornDick. He was a very good producer. He's won, I think, 8 Grammys. And they wanted somebody that had a lot of hits to reinterpret them in the bluegrass. So they thought about me. That was a good idea and I had a good time doing it. I almost won Grammy, not quite. I made the Top 5 but I didn't win it." Who picked the songs for the album? "Myself and the producer Bil and the record company got together. It's very difficult, for example, to do (starts singing) 'Under the Boardwalk...' It doesn't sound bluegrass. But it's OK. It worked OK. And 'Cry', it's a big balad. Some used to doing it big. And with the bluegrass we did it very quiet, very acoustic, very different. It was very hard to sing 'Rose Garden' in the bluegrass way because I'm so used to doing it my way that to do it somebody else's way was confusing. Did you hear Martina McBride sing it?" Yeah, and I saw you both in a duet on TV on the Grand Ole Opry. How did you feel when you found that she had recorded 'Rose Garden'? "It's a compliment. I think especially because she chose all of her favorite songs from the classics and 'Rose Garden' was the one she chose for the single. So that means it was the best. It's still a great song. No matter how many years go by. It's stil a great song. So it was big compliment and she studied my vocal. I mean if you put her record and my record next, it's very difficult to tell them apart. She sang just like me. So that's a big compliment from Martina McBride. Doing it together was a little scary because she sings a little bit higher than me. So I had to push real hard. But it was good , did you like it?" Yeah, I loved it. Actually it was the very first country song that ever I heard and that moved me to start to be interested in country music years ago. "Oh, thank you. I've heard that from a lot of people because it's a great country song. But it's not hillbilly. A lot of people can understand that and relate. They had that feeling." Do you like making music videos? "You know what? I've done a lot of television but I've never done a video. The videos came along just when I was stopping. One day I'll get to do a video." And how about the new video for 'Cry'? "Ah, that's right! That's very simple. I was in the studio just singing. Yeah, I forgot that. That's official. But I did a lot of television. When I was really working hard, I think I did more television than anybody, a lot with Bob Hope, Dean Martin and those people, the big pop stars. I was on TV every week." Did you ever perform in Europe before? "Yes, I've been in England several times, I was in Germany, several times in Munich and in Frankfurt but not very much. I don't know why. I never did a lot of working in Europe but I would like to. It's nice, it's fun."